Why should you buy a pair of SEASOFT TACTICAL TRIM POCKETS? Sometimes you only need 5 to 10 lbs. of ditchable weight because of the gear you are wearing. Each of the SEASOFT TACTICAL TRIM POCKETS™ holds up to 5 lbs. of soft weight and allows a diver to add up to 10 lbs. of ditchable weight to their dive gear. IMPORTANT: Never add more than one pair of ditchable trim pockets to your gear. 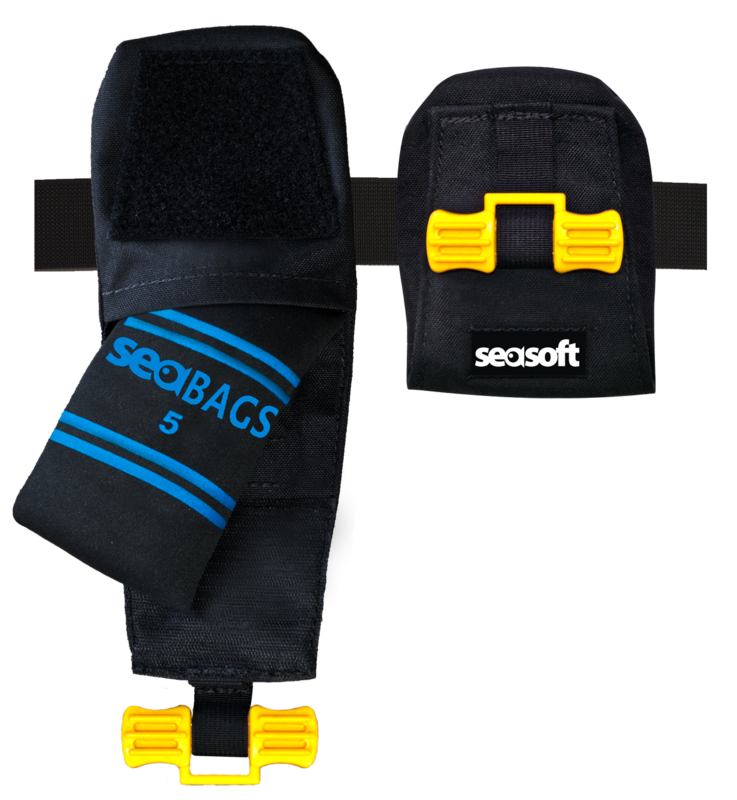 SEASOFT TACTICAL TRIM POCKETS™ mount with overlapping 2" VELCRO™ bands that are held in place by being against the body of the diver. IMPORTANT: TO DITCH YOUR WEIGHTS - PULL the YELLOW handles straight down! 3. By mentally running through the ditching motion before every dive. This will acclimate you to be prepared to ditch your weights in any emergency should it arise during a dive. If ditching your weights is not completely ingrained into your subconscious then you are simply no prepared to dive safely. SEASOFT TACTICAL TRIM POCKETS™ can be turned "upside down" and used as trim pockets and mounted on your tank straps or anywhere. SEASOFT's TACTICAL TRIM POCKETS™ are an easy way to add up to 10 lbs. of ditchable weight to your gear. SEASOFT's TACTICAL TRIM POCKETS™ are a unique and innovative way to add ditchable weight to any 2" or 1.5" webbing. Each pocket holds up to 5 lbs. of soft weight allowing a diver to add up to 10 lbs. of ditchable weight to their dive gear quickly, safely and easily. The SEASOFT TACTICAL TRIM POCKETS™ are held onto a diver's webbing via overlapping 2" VELCRO™ bands that will not allow the pocket to become loose because the pocket is held tightly against the diver by the webbing. By simply pulling the YELLOW handle straight down the weights inside the pocket fall out. It is vital that the pocket opening be at the bottom so that the weights can be ditched in an emergency. This will acclimate you to be prepared to ditch your weights in any emergency should it arise during a dive. If ditching your weights is not completely ingrained into our subconscious then you are simply not prepared to dive safely. The TACTICAL TRIM POCKETS™ are a versatile, ingenious way to add ditchable weight to your gear. Try a pair for safer, more comfrotable and easier diving.